Count on Fork Truck Direct when it’s time to buy Electric Reach Truck forklifts Essex can be proud of. With over 20 years experience under our belt, there are plenty of reasons why we are recognised as the number one independent forklift provider in our region, and the first stop for many who want to purchase Electric Reach Truck forklifts, Essex-located. Electric Reach Truck forklift sales in Essex make sense on a number of levels in business – our trucks are valued for their flexibility and usefulness in warehouse environments. That’s because at indoor storage sites with the tallest racking and narrow isles, electric reach trucks are easy and user-friendly to operate from an operator position which is side seated, meaning that the operator is provided with greater visibility of the fork tips. Because we work with the top electric reach truck manufacturers we can offer our customers all the best new innovative features which can improve their operational efficiency while working. These sector leaders have diligently designed these electric reach trucks for challenging industrial and commercial environments, affording you the advantage of features like steering travel compensation, which can make tricky tasks a doddle, minimising accidents. Purchase Electric Reach Truck forklifts in Suffolk from Fork Truck Direct. They are capable of revolutionising your work practices, being extremely manoeuvrable and able to work in areas where space is constricted. They are budget-friendly to run, and offer high reach capability which means you can make the most out of your warehouse by increasing racking storage vertically. We are the place to come for Electric Reach Truck forklift sales Suffolk-located. 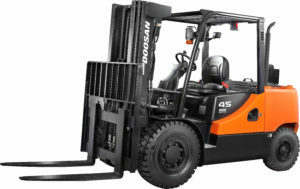 At Fork Lift Direct, we are recognised as an award-winning leading independent distributor for the manufacturer Doosan, and consequently are able to pass on savings to our customers and offer the very latest electric reach truck forklift models. Call us today on 01245 322252 and discover how a new electric reach truck can boost your business.